French chemist Paul Emile Lecoq de Boisbaudran isolated dysprosium oxide from an impure sample of holmium oxide in 1886. He had great difficulty deriving the metal itself from the oxide, and thus named the element from the Greek dysprositos, meaning “hard to get”. It is unsurprising that the metal was so hard to isolate, as significant pure quantities of many of the rare earth elements could not be obtained until ion exchange techniques were developed in the 1950s. A number of compounds containing dysprosium emit light under defined conditions, making them useful for a number of applications. Dysprosium-doped calcium sulfate or calcium fluoride crystals luminesce when they have been exposed to radiation, and thus are used in dosimeters for measuring radiation exposure. Dysprosium iodide and bromide are used in metal-halide lamps, which produce extremely bright white light that is valued in the film industry. Additionally, dysprosium compounds can be used to produce infrared light and are often used in infrared lasers. Dysprosium and its compounds are also valued for their magnetic properties. Easily magnetized dysprosium compounds can be used in data storage applications such as hard drives, and dysprosium is often used to substitute for some of the neodymium in neodymium-iron-boron magnets. Substituting these high-powered magnets with dysprosium increases their corrosion resistance and coercivity. Neodymium magnets are essential for electric motors, magnetic memory devices such as hard drives, and many other modern electronics. Dysprosium-containing garnets with magnetic properties are used in magnetic refrigeration devices, which can be used to reach extremely low temperatures. Finally, Terfenol-D is an alloy of terbium, iron, and dysprosium that is magnetostrictive: it contracts or expands when exposed to magnetic fields. This property allows direct conversion between electrical and mechanical power, and the alloy is used in sensors, actuators, and acoustic and ultrasonic transducers, and active noise and vibration cancelling devices. Dysprosium is highly effective at absorbing neutrons, and is therefore used in nuclear reactor control rods. It can also be used to produce nanofibers that have high strength and are naturally corrosion resistant, and these have the potential for use as reinforcement in ceramic materials designed for high-temperature applications. Dysprosium, like other rare earth elements, is never found in its pure form in nature. It can be obtained only from rare earth containing minerals such as xenotime, monazite, and bastnasite, or from ion-adsorption clays. Dysprosium is most commonly used in neodymium-iron-boron high strength permanent magnets. While it has one of the highest magnetic moments of any of the rare earths (10.6µB), this has not resulted in an ability to perform on its own as a practical alternative to neodymium compositions. It is however now an essential additive in NdFeB production. 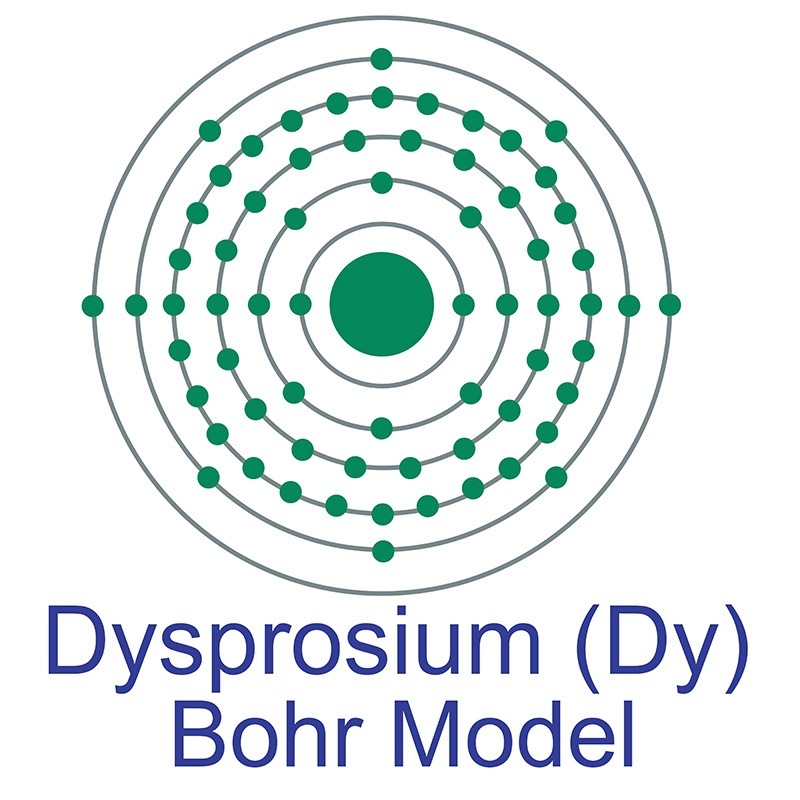 Dysprosium is also used in special ceramic compositions based on BaTiO formulations. Recent research has examined the use of dysprosium in dysprosium-iron-garnet (DyIG) and silicon implanted with dysprosium and holmium to form donor centers. Dysprosium is added to various advanced optical formulations due to the fact that it emits in the 470-500 and 570-600 nm wavelengths. Dysprosium metal is used in rare earth magnet alloys and magnesium alloys. Due to dysprosium's high susceptibility to magnetization, it is also used in a variety of data storage applications, such as in compact discs. Dysprosium is available as metal and compounds with purities from 99% to 99.999% (ACS grade to ultra-high purity). Elemental or metallic forms include pellets, rod, wire and granules for evaporation source material purposes. Dysprosium oxide is available in powder and dense pellet form for such uses as optical coating and thin film applications. Oxides tend to be insoluble. Dysprosium fluorides is another insoluble form for uses in which oxygen is undesirable such as metallurgy, chemical and physical vapor deposition and in some optical coatings. Dysprosium is also available in soluble forms including chlorides, nitrates and acetates. These compounds can be manufactured as solutions at specified stoichiometries. Dysprosium is a Block F, Group 3, Period 6 element. The number of electrons in each of dysprosium's shells is 2, 8, 18, 28, 8, 2 and its electron configuration is [Xe] 4f10 6s2. The dysprosium atom has an atomic radius of 178 pm and its Van der Waals radius is 229 pm. In its elemental form, CAS 7429-91-6, dysprosium has a silvery-white appearance. Dysprosium is found in various minerals including bastnäsite, blomstrandine, euxenite, fergusonite, gadolinite, monazite, polycrase and xenotime. It is not found in nature as a free element. Monazite sand is the primary commercial source of dysprosium. Dysprosium was first discovered by Paul Emile Lecoq de Boisbaudran in 1886. The element name originates from the Greek word 'dysprositos' meaning hard to get at. Dysprosium is moderately toxic. Safety data for Dysprosium and its compounds can vary widely depending on the form. For potential hazard information, toxicity, and road, sea and air transportation limitations, such as DOT Hazard Class, DOT Number, EU Number, NFPA Health rating and RTECS Class, please see the specific material or compound referenced in the Products tab. The below information applies to elemental (metallic) Dysprosium.